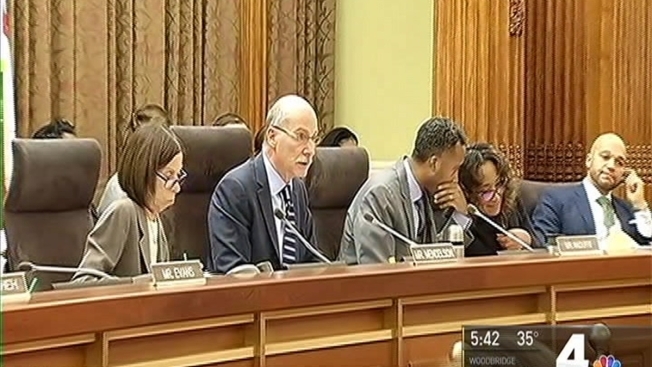 The D.C. Council has passed a bill to grant D.C. workers eight weeks of paid family leave. The bill was approved on a 9-4 vote. Many people in the room applauded and held up signs thanking the Council. "It's good for our workers, it's good for our economy, it's good for our city," Councilmember Elissa Silverman (I-at large) said. If approved, the program would create one of the most generous paid leave programs in the nation. The D.C. Council takes its final vote on a controversial paid family leave plan Tuesday, but Monday there were last-minute efforts to make big changes to it. Anyone would works for a private employer in D.C. would be allowed eight weeks of paid leave upon the birth or adoption of a child, six weeks of paid leave to care for an ill family member and two weeks of personal sick leave. The program would be funded by a 0.62 percent increase to the D.C. payroll tax and administered by a new city agency. The Council voted down an alternate plan presented Monday by Councilmember Jack Evans (D-Ward 2) and Councilmember Mary Cheh (D-Ward 3). What does the legislation propose? The program would grant full-time and part-time workers in D.C. eight weeks of paid leave to take care of newborn or adopted children, six weeks of paid leave to help ailing relatives and two weeks of personal sick leave. Both fathers and mothers would be eligible to take time off. The legislation would be funded by a 0.62 percent increase to the payroll tax. The first taxes would not be collected until 2019, and the first benefits would not be paid out until early 2020. Employees would be eligible to receive up to 90 percent of their pay, with a weekly cap of $1,000. Would a D.C. paid leave law affect federal government workers? No. The District cannot impose taxes on the federal government. Would a D.C. paid leave law affect people who live in Maryland or Virginia but work in D.C.? Yes, and opponents of the plan say that is unfair because these D.C. employees do not pay D.C. income taxes. How has the D.C. Council previously voted on this bill? The Council gave preliminary approval to the bill in an 11-2 vote earlier this month. Cheh and Evans said their revised bill would cost the city an estimated $40 million per year, compared to $250 million for the current legislation. What was the alternate plan the Council voted down? Cheh and Evans had an alternate bill that would have required private employers to provide the specified amounts of time off. Businesses with 70 or fewer employees would have been eligible for an annual tax credit of $200 per employee to ease the cost of compliance. Their plan would not have created a new agency. What have businesses and nonprofits said? On Monday, several businesses and nonprofit groups said they prefer a bill that would direct companies to provide the benefit without the tax. “We just feel that we are in a much better position than the District government to determine how best and how effectively we get that paid leave to employees,” Solomon Keene of the Hotel Association of Washington said. “Doesn't create more bureaucracy, which I think many of us in the D.C. business community are a little bit tired of,” Diane Gross of Cork Wine Bar said. 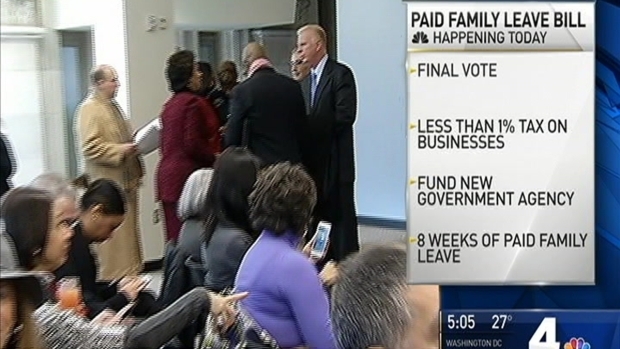 Supporters of paid family leave denounced the last-minute business bid to weaken the proposal. “They're speaking in the best interest of small business owners, when actually what they’re doing is trying to find a way to pass a law that would be far more beneficial to large corporations,” said Michelle Sternthal of Main Street Alliance. D.C. Mayor Muriel Bowser can veto the bill or let it go into effect without her signature. If she vetoes it, the Council will need nine vetoes to override the veto. Bowser has repeatedly challenged the legislation, citing its cost. She told The Washington Post in an interview Monday that the revised bill proposed by Cheh and Evans was "more likely to win my support." “I can say this: If I was on the council, I’d be voting for it,” she told the Post. Bowser would not say on WAMU Radio last week if she would veto the bill if it passed.